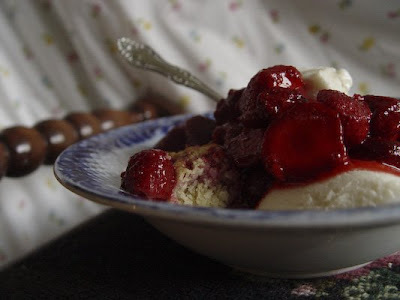 Fresh mountain strawberries. . .homemade biscuits. . .creamy frozen dessert. . .the perfect summer supper on a hot summer day. Celebrating in red, white, and blue! *Served in a bowl that once belonged to husband's great-great-great-aunt who lived during the Civil War. I just love your blog! It's so refreshing and you amaze me with all of the simple, yet inviting, things that you do. I love the pictures, the vintage things, the recipes like the rose syrup that I've never heard of before, and just everything. Thanks so much for being better than any magazine! Mmm, that dessert looks tasty. I have not yet made strawberry shortcake this year. I'd better do so before the season for fresh strawberries ends. I like it served over a slice of almond cake. I've been enjoying the seasonal loveliness of your blog this summer. Just perfect. Yeah, someone who makes strawberry shortcake out of biscuits. I think a sweet biscuit is the perfect thing for any type of shortcake. I had a peach shortcake over the weekend at a restaurant and althought the peaches were fresh and local, the little cake under it was so wimpy. Ruined the whole thing.